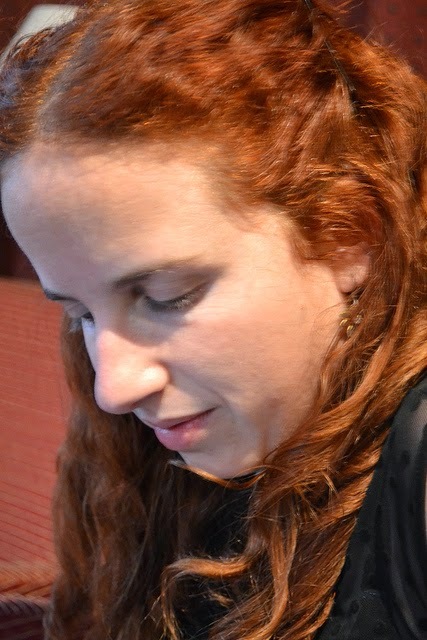 The Eloquent Woman: Famous Speech Friday: Stav Shaffir and "What is a Zionist?" Famous Speech Friday: Stav Shaffir and "What is a Zionist?" In February, The Eloquent Woman participated in a webinar about public speaking fears, including the fear that some women have about putting themselves out there with a speech containing strong opinions. These nerves can silence women and give away their power before they even open their mouths--and there's too much of that going on already. Member of the Israeli Knesset (MK) Stav Shaffir recently offered a great reminder of what we might miss if we keep quiet rather than challenge authority or voice an unpopular opinion. Her blast of a speech in the Knesset in January got her removed from the chamber, but went viral and prompted an international discussion about Israel's economic and military future. Getting escorted from the room is becoming a trend for Shaffir, the youngest member of Israel's parliament. Shaffir was removed twice from a Knesset Finance Committee meeting in December 2014, after she and others questioned a last-minute transfer of funds to the Israel Defense Ministry. In October of 2014, she was physically dragged from the committee at the request of the chairman, after demanding more transparency in the committee's dealings. Surrounded by angry heckling and protests from some in the ultra-Orthodox community, Shaffir and two other women MKs have also joined other women in praying, wearing traditional prayer shawls and reading from the Torah at Jerusalem's Western Wall, in defiance of the tradition that has normally banned women from such practices there. "I don't like the fact that, in 2013, less than a quarter of our parliament is women...women are not very welcome there," Shaffir said during that year's elections. "I'm spending a lot of time talking to younger women...to give them the example that it's possible, we can do it, that we can survive in that violent, masculine atmosphere." Shaffir's "What is a Zionist?" remarks are an exclamation point of a speech, so passionate and yet so succinct in spelling out the values and goals of Israel's left that many have called it a "credo" or "manifesto." What can you learn from this famous speech? Gain structure for your speech from repetition. Shaffir uses repetition to describe the people she says are getting rich as a result of right-wing budgets; the people who are losing out in Israeli society as a consequence; and how this contrast defines what she calls a true Zionist. In the first two instances, repetition serves to lay out her case against the right wing, as a sort of recitation of pros and cons. After that, she uses repetition to build up to an emotional ending. Shaffir said her remarks were impromptu (more on that below), so repetition also may have given her a little extra time to collect her thoughts as she spoke. Speak directly to a specific audience. This speech would feel far less compelling if Shaffir used constructions such as "The opposition wants..." or "Those who say this..." to speak about the right wing. Instead, she uses "You" over and over again, as if she is having an argument with one person standing right in front of her. It's an attention-grabbing tactic, and it fits in well with the fury behind her words. Speak now, and seize the moment. Ever want to say something on the spot, but stay silent because you only speak in public with notes and weeks of preparation behind you? There's a place for those kinds of speeches, and then there's a place for your thoughts right here and right now. Shaffir said afterward that she had not planned her remarks that day, but improvised them after hearing another politician attack her party in the Knesset. In this case, a planned speech probably wouldn't have had nearly the emotional impact--or the crackling brevity--of this response.